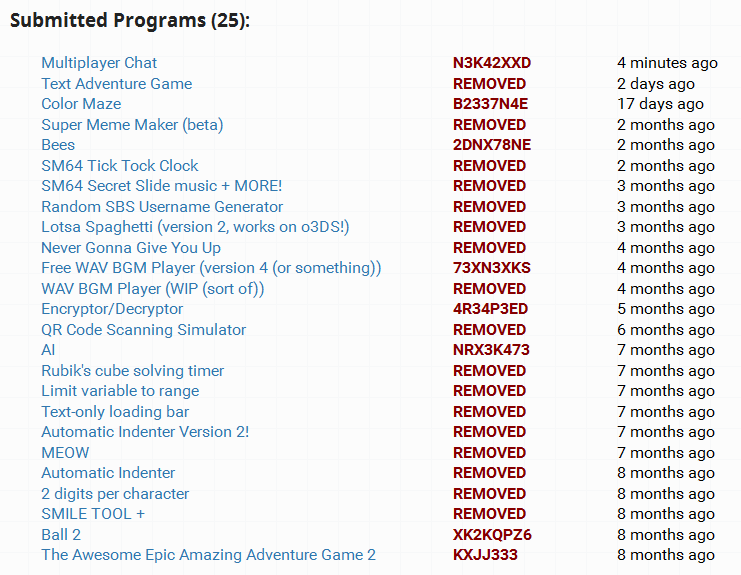 Could programs with REMOVED keys be shown below the other programs, maybe with some kind of separation? I assume the "flag" button is used to prevent racism, sexism, prejudice, etc. It's generic. All that a flag does is bring admin attention to a post. There have been a few instances where an accidental flag or overreaction which admins chose to take no action with because we're not here for censorship still brought their attention to a dead enough thread, which they chose to close. If you want to use it like that, go ahead. We're already pretty good at guessing what the flagger intended. If it becomes a problem we'll just ask you to stop. There should be a Module for when you're first in The Userlist you can do /brag and brag about it. Being first in the userlist is fun.